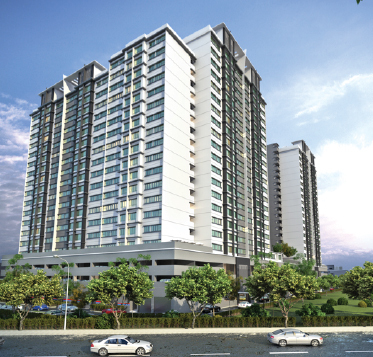 1Razak Mansion is a complete redevelopment of the Razak Mansion public housing scheme in Sungai Besi. Covering a total area of 33.12 acres, 1Razak Mansion will comprise three (3) blocks 18-storey featuring 658 contemporary residential units, each with a built up area of 800 sq.ft. Every new unit will have three bedrooms and two bathrooms. Existing residents of Razak Mansion stand to benefit from a 1:1 (one to one) replacement concept. The redevelopment is aimed at transforming the area into a more conducive living environment with upgraded residential properties relevant to current needs that will significantly improve the quality of life, for communities within and around the area. The surrounding area of 1Razak Mansion will also see a major make-over with community facilities such as a surau, town hall, shops, police station, kindergarten and a funeral parlour. The project would be jointly carried out by the Kuala Lumpur City Hall (DBKL) and Syarikat Impianika Development Sdn Bhd. The 1Razak Mansion project is targeted to be completed by the first half of 2017.